The College of Nagindas Khandwala Recruitment Notification 2018. 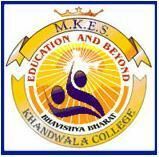 The College of Nagindas Khandwala inviting applications for the positions of Assistant Professor .Interested and Eligible candidates can apply for the positions. Last Date for Submission of Application is on April 26th, 2018..
Applicant’s age limit must be in a middle of 21 to 45 years. Contenders need to possess B.Com/B.A/M.A/B.Sc.IT/B.Sc.Cs from any recognized university. Applications with full details should reach to the below mentioned address on or before the closing date. The Principal, Bhavishya Bharat Campus, Road no.1, off. S.V. Road, Malad (West), Mumbai-400 064.